to find out how to make one. It was very timely as I have a 50th birthday party to attend tomorrow, had a brand new stamp set I wanted to play with, and it all just seemed to fall together nicely! I hope the man in question likes it - he is having a surprise cowboy party, courtesy of his loving wife, daughter and friends. So this is a secret card till tomorrow night .... shh! Lol! 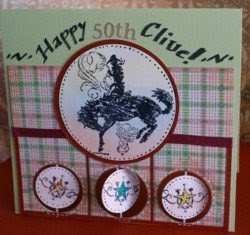 If you would like to see how I made this card, go to my PaperCraftCentral site, to this page. I'm sorry I haven't been by in a while, I am absolutely loving my new job but the deal was I don't get the full salary I asked for until I have been trained & the review will be in six months. Might sound harsh but they have taken me on despite not being able to do the job, & for a woman of my age that is pretty rare her in sweet old UK! I am determind to learn as fast as I can & although it means some of my life has to take a back seat, it will be well worth the hard work & effort in the long term, because more wages means more scrap stash!!!!!! Thanks for visiting my Blog Susan, this is a great card. Your card is amazing Susan! I love it! That set is great for male cards hey! Sorry for getting back to you so late but I cant wait to hear the possible news you have! That is FANtastical!!!! Wow!! I never, ever thought of doing more than one suspension in a card!!! I love this!! And the Western theme is so perfect!! What a truly special card you created Susan!!!! PS......dang the postal service.....it's been a loooooong time since I mailed your package and I'm so anxious for you to get it!!!! This is a wonderful card. Somehow I have missed the suspension technique so I thank you for introducing me to it. Life has been very busy the past tow weeks for me but I am now getting back to my stamp room and I plan on trying this out. producing site. When the time it right I am sure it will happen.